Beautiful second floor Naples Luxury Villa includes an optional Membership at the MEMBERS CLUB OF MARCO which offers The MARRIOTT MARCO BEACH AND SPA, all Social Events plus lots of perks! It can be purchased separately after the closing! 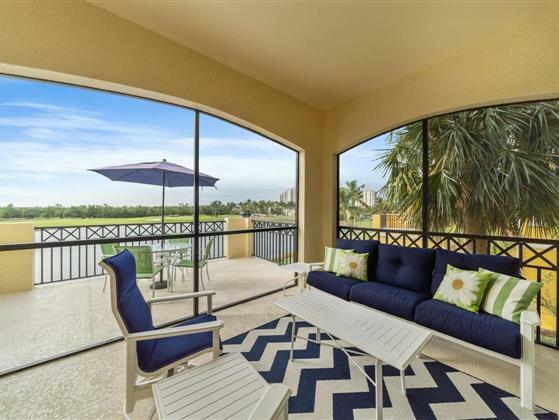 The condo overlooks Hammock Bay’s 18th hole and a long wide lake view. This 2480 sq ft condo with a 2-car garage which feels like a single family and has fresh paint, plantation shutters, wood flooring in the living area plus tile on the diagonal in the wet areas. Spacious kitchen has granite, lots of cabinets, center island, two breakfast bars and the furniture is negotiable. The rear balcony with French doors is located off the family room and looks out to a water feature and view of the 5th fairway. Generous Master Suite has dual sinks, soaking tub, large walk in shower and private commode. A separate guest area hosts 2 spacious bedrooms with a full bathroom, plus powder room.